The summary of Robert Mueller’s report, given to Congress by Attorney General William Barr, asserts that President Trump engaged in a number of actions that impeded the investigation. At the same time, it concludes that Trump’s campaign did not criminally conspire with Russia during the 2016 campaign. Barr seizes upon the latter point — no criminal collusion — to dismiss the former point. 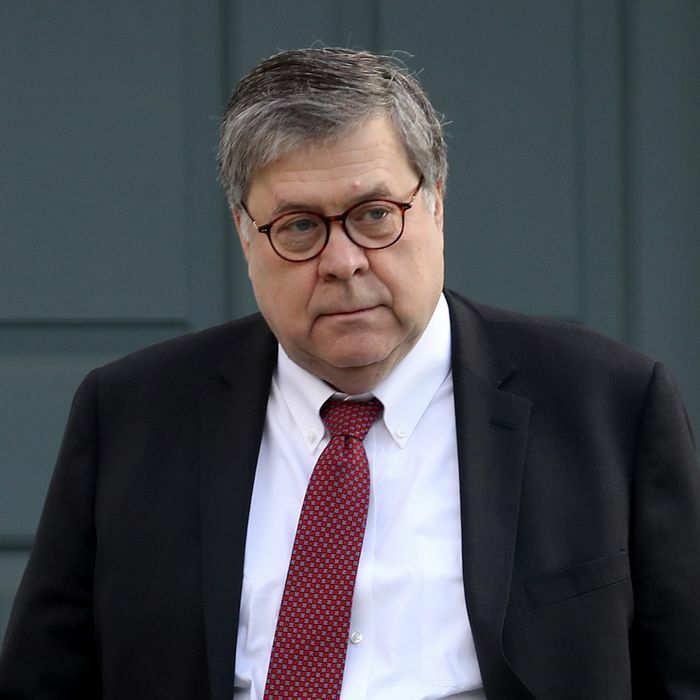 While Mueller punted on whether Trump broke the law, Barr decided to deem his conduct not a crime. “The absence of such evidence bears upon the President’s intent with respect to obstruction,” write Barr. No underlying crime, he argues, means no obstruction. Barr’s logic is upside down. He is saying the finding of no criminal collusion undermines the findings that Trump obstructed justice. In fact, the obstruction undermines the findings of no criminal collusion. Mueller has apparently found no criminal collusion between Trump and Russia, a finding that is hardly shocking. As Trump’s defenders have pointed out, collusion is not a crime. There are crimes that fall under the category of collusion — many former prosecutors have theorized that Mueller could indict Trump or his campaign under a conspiracy charge. Mueller did not find evidence strong enough to prove in a court of law, and possibly not at all. It is bizarre, however, to spend two years insisting collusion is not a crime and then turn around and call the absence of crimes proof that there was no collusion. Of course Trump colluded with Russia. He literally went on camera and asked Russia to hack Hillary Clinton’s emails, promising that Russia would be rewarded by the American media, and Russia responded to this request by attempting a hack to steal Clinton’s emails that very day. Trump’s campaign aides repeatedly welcomed and sought out Russian assistance. His campaign manager passed on 75 pages of intricate polling data to a Russian operative during the campaign. And he did all this while secretly pursuing a lucrative business deal with Russia. As I wrote recently, “The unanswered questions here center on how much deeper this cooperation goes, and what laws might have been tripped.” Apparently, the answer is none. And there is no reason to doubt either Mueller’s finding he found no criminal collusion, nor Barr’s unequivocal summary. However, the notion that the lack of evidence absolves Trump cannot possibly be squared with the steps he has taken to obstruct justice. Barr’s summary does not detail all the obstruction (or perhaps, obstruction-like) steps Trump has taken, but it does note many took place in public. The most damning was his repeated encouragement of his campaign lieutenants not to cooperate with Mueller’s investigation. His lawyer reportedly dangled pardons for Michael Flynn and Paul Manafort, and there is almost no doubt the prospect of a pardon encouraged Roger Stone to stay strong. People who want to demonstrate their innocence make displays of cooperation with investigators. They promise to tell them everything they know, and encourage their subordinates to do the same. Trump did the opposite. He refused to give the special counsel an interview. He used his pardon power to encourage his subordinates to withhold cooperation. This behavior obviously does not prove that Stone and Manafort implicated their former boss. It might have been a successful cover-up, or it might have been behavior that looked like a cover-up yet lacked an underlying offense. The point is that his flamboyant refusal to cooperate deprives Trump of any claim to having been cleared. As Trump stated repeatedly, he considers “obstruction of justice” just a term to describe fighting back. Trump hired Barr for the role after Barr wrote a private memo attacking the obstruction of justice component of the Mueller investigation, and discussed the memo with Trump before his nomination. Now Barr has followed through on the position that he laid out, and which apparently recommended him for the job. Congress obviously cannot take Barr’s summary of Mueller’s findings as the final word, and will demand to see the entire thing. By Trump’s own terms (and apparently Barr’s), he fought back and won. That, however, is not the same as being exonerated. In fact, it precludes it.